The first issue is during mirror creation in a multi-target configuration. In the final step, the user is prompted for secondary relationship information. In previous OS versions, a default Source IP is provided on this Additional Information Needed dialog. 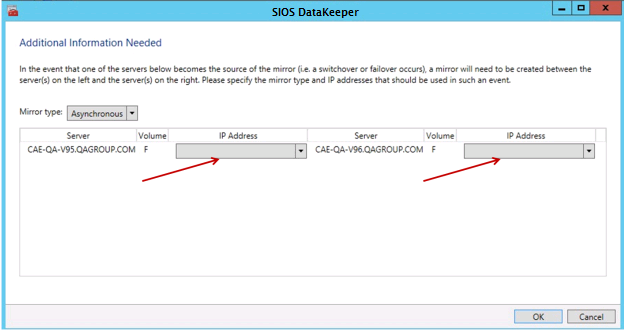 In Windows Server 2012, however, this default IP is not provided, but the correct IP address must still be selected. If OK is clicked without selecting the IP address, the mirror will still create, but key relationship information will be missing. 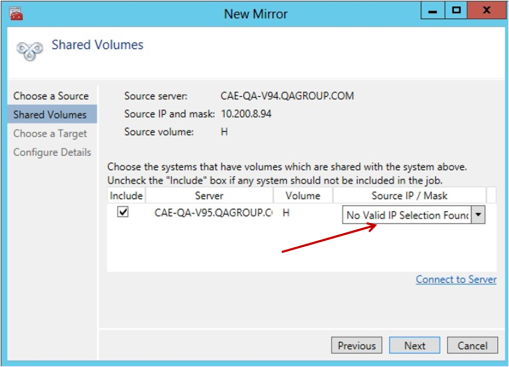 The other issue is with the Shared Volumes dialog box when creating mirrors with shared volumes. In previous OS versions, a default Source IP is provided on this screen. In Windows Server 2012, however, this dialog will display “No Valid IP Selection Found.” The correct Source IP will still need to be selected.